There is a popular myth that makeup or cosmetic products will harm your skin if you use them regularly. Well there is no truth in that. Firstly, make sure you are not using any expired or low quality products that too with harmful chemicals. Secondly and most importantly, always remove makeup before hitting the bed and apply a good moisturizer at the end of the day. Make it a point to never sleep with makeup on or you will wake up with nasty breakouts. This is where a makeup remover comes in the picture. It is very important to invest in one good makeup remover so that it will adequately remove all traces of makeup and is gentle enough to not sting the eyes. So here are the 11 best makeup removers in India for every skin type be it dry, oily, sensitive or acne prone. Micellar water is the newest obsession of the beauty industry. We love how refreshing and fuss free these are. 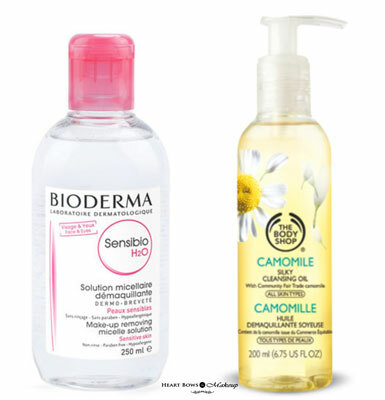 A cult favorite Micellar water is the Bioderma Sensibio H2O. It comes in a clear cylindrical bottle with a pink cap. The water has a mild cleansing effect and works extremely well for sensitive skin. It makes the skin look healthy and removes every residual layer of makeup within seconds while maintaining the skin’s balance. It is soap-free and has physiological PH making it the best makeup remover for sensitive and oily skin in India. The Body Shop has an entire Camomile range for makeup removers. One of the best is their Camomile Cleansing Oil. It comes in a plastic bottle with a pump. All you have to do is gently rub it around your face and the make-up, including waterproof mascara will come off easily. It is the best makeup remover for sensitive skin and lens wearers. Being an oil based product it suits dry skin as well. TBS also has a Camomile Sumptuous Cleansing Butter, which is a solid, butter- like balm that removes makeup like magic and leaves the skin refreshed and smooth. We highly recommend this range. Removing eye makeup is always challenging as it is a sensitive area. 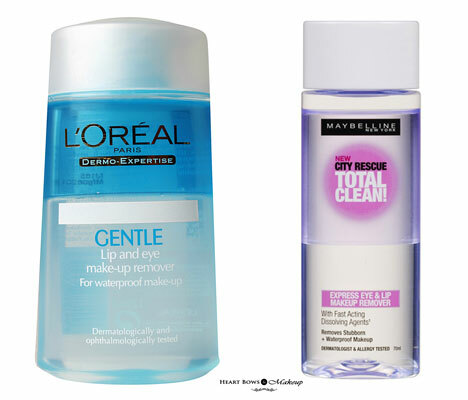 For effectively removing water proof makeup without irritating the eyes, the L’Oréal Gentle Eye Makeup Remover comes in handy. This is a bi-phased remover and needs to be mixed before use. You don’t need to tug or swipe too much as the remover does its job well. Further, it is ophthalmologist tested, safe for contact lens wearers and won’t sting or irritate the eyes at all. It is the best drugstore makeup remover in India for waterproof makeup. 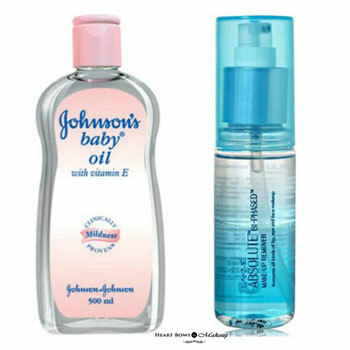 The Johnson’s Baby Oil is not just an oil for babies. It is like a magic elixir for many people. This gentle oil takes off every layer of long lasting, water proof and smudge proof makeup and does not sting the eyes at all. It is extremely good for dry skin as it is nourishing and hydrating as well. The product is cheaper and better than so many makeup removers in the market that we just had to feature it. It is also one of our favorite beauty products under 100 bucks. 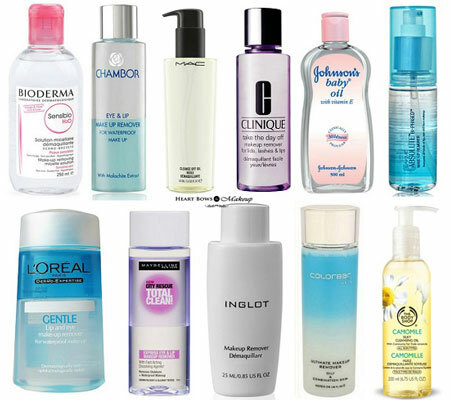 Top 11 Waterproof Makeup Removers in India: Affordable & High End Options! This is a great budget friendly makeup remover easily available in India. It is a water and oil based product. The remover is ideal to take off stubborn makeup at the end of the day, including the eyes and lips. It makes the vision slightly blurry but will not sting the eyes. The Lakme Absolute Remover also wipes off traces of oils and dirt and will leave the skin clean and hydrated. It does not break out the skin and the bottle lasts quite a long time as a little goes a long way. 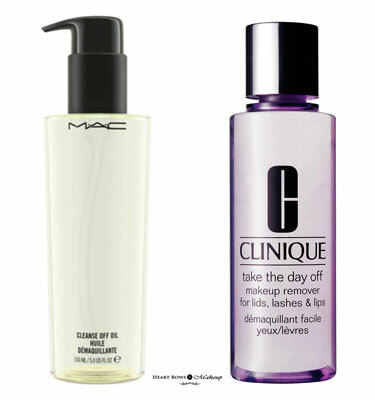 MAC not only delivers top notch quality makeup products but also has a great makeup remover in their line of products. The MAC Cleanse Off Oil is a cult favorite amongst various celebrities and makeup artists all around the world for its brilliant efficacy. Firstly, it is formulated with oils of the olive fruit, evening primrose and jojoba seed and is absolutely mineral-oil free. It comes in a pump dispenser bottle, has a light texture and a sweet scent. The MAC makeup remover removes every layer of stubborn makeup like no one’s business. Apart from the high price point we have nothing bad to say about this best MAC makeup remover. Clinique has great quality products and this is another gem from their collection. It is a silicone-in-water, dual-phase liquid makeup remover that effectively removes most makeup in a single swipe. 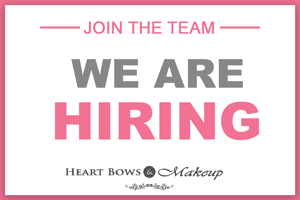 For water proof and smudge proof makeup, it may take two to three swipes. The product is fragrance free, opthalmologically tested and safe for lens wearers too. It is a bit pricey but surely does the job well. The Inglot remover comes in a white opaque bottle, has a water based texture and consistency of a serum. The remover works really well for heavy makeup and waterproof products. It is gentle on the skin, does not sting the eyes and doesn’t make the skin oily, hence you can also skip washing the face if you want. The Inglot Makeup remover is a paraben free makeup remover in India and worth trying out. The Colorbar Ultimate Makeup Remover comes in 4 variants (oily, dry, crème and sensitive skin). It has a sturdy plastic bottle with cylindrical shape and a transparent body. The mixture inside the bottle often separates but all you have to do is shake the bottle before use. You require a very small amount and it effectively cleanses every layer of dirt, grime and makeup without stinging the eyes or making the skin red. The Colorbar Makeup Removers are one of the best affordable makeup removers in India. 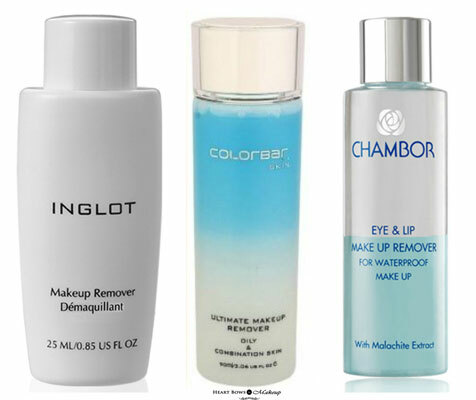 The Chambor Makeup Remover helps to remove stubborn water proof and smudge proof makeup products. This makeup remover is a bi-phased one i.e. a mixture of water and oil and it has to be shaken well before use. The liquid does not irritate or sting the eyes at all and it brilliantly removes every trace of makeup. It is also suitable for contact lens wearers. The product might be pricey but well worth it. Tell us in the comments below which are your favorite makeup removers in India.